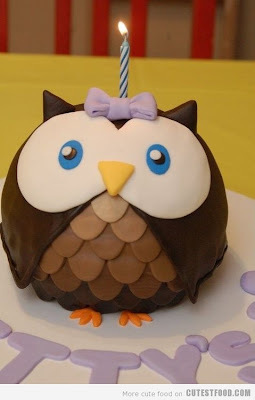 You want to have a "Whooo's Turning One" party and see this cake on Pinterest. You say to yourself, "I couldn't do that. It's too hard." You are wrong. Take baby steps. 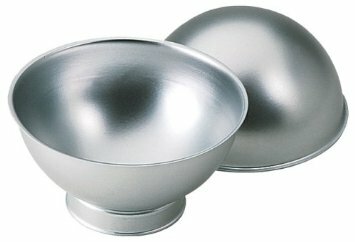 Step One: Go to Amazon.com and order a round 3-D cake pan. They have it. 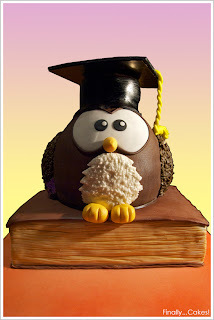 I pinned the link on my Pinterest birthday board for you. The two parts clamp together to make the ball. ALWAYS USE SPRAY ON SHORTENING WITH FLOUR MIXED IN FOR EASY RELEASE. But...I wouldn't do that for this cake because I want the sticky canned frosting that stays wet. 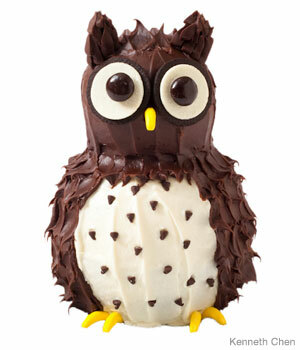 That way I can add fondant feathers and shaved chocolate to it. Google one in your area. Find it. Memorize how to get there. Buy brown fondant in a tub. Buy white fondant in a tub. Honestly, it's like buying playdough. Step Four: Roll it out on the counter with a dusting of confectionery sugar. Or roll it through a pasta maker. (Best gift I ever got). Use a small round cutter to cut out brown feathers. Cut each circle in half to layer them on the front of the ball for the stomach. On the top 1/3 of the ball, use chocolate shavings. Get the biggest candy bars you can find. Grate them with your grater. Note: You could reverse this and put the chocolate shavings on his tummy and the round circles on his back and sides. (Oh, you don't want to shave chocolate. Well, use chocolate jimmies from the cake decorating aisle at the food store. http://www.thelittledelightsinlife.com. She has videos to help you along the way. 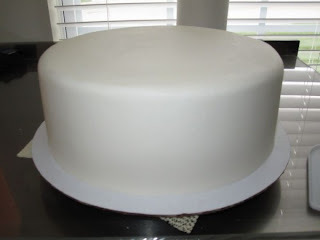 Cut out two very large circle of white rolled fondant for the eyes. Take another small piece of fondant. Work blue food coloring into it. Roll it out and cut out two pupils. 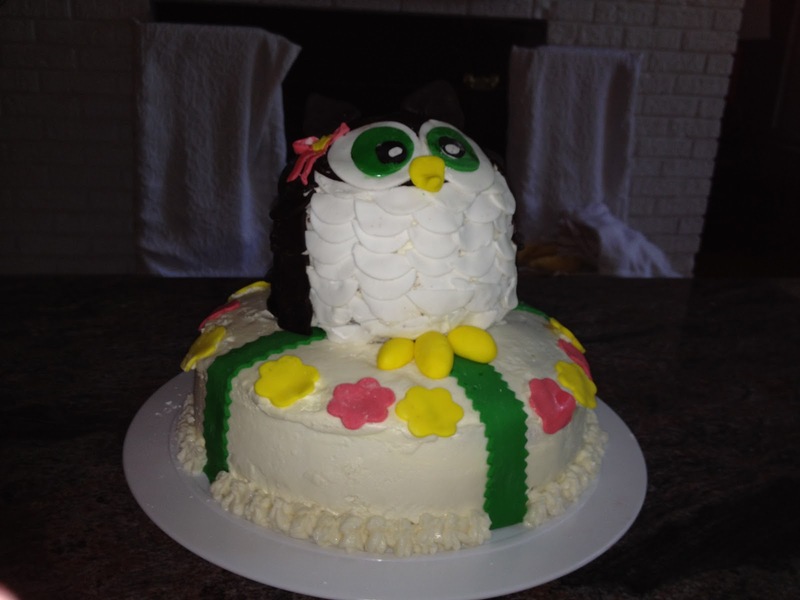 Take another small bit of white fondant and work yellow food coloring into it. Roll it out. Cut out a triangle. The ears can be candy bars too--to match the shavings. The feet can be fruit candy slices. You're DONE. I did NOT bake these cakes. I found images of them on the web. But they give you ideas for decorating your owl cake. Chocolate Frosting, m &m eyeballs and cheese puffs. Below they just used almonds for the feathers. 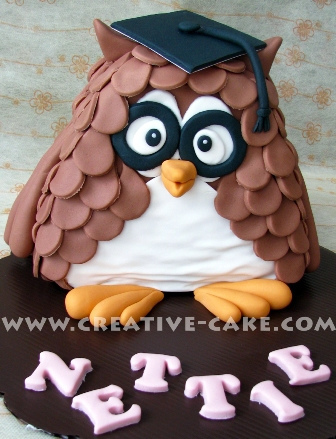 The graduating owl just has a plain white tummy with lots of fondant circles for feathers. Above is a photo the the owl cake I made. I bought a pasta ribbon cutter, flower, and circle cutters. I used the middle size cutter for the white feathers, then cut each one in half. I used the large circle cutter for the brown feathers. The birthday girl was turning one and loved it. So did her grandmother, my friend. 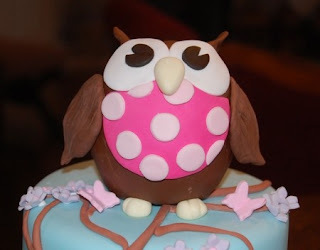 I used the paper towel frosting smoothing idea I saw on Pinterest.